The following tutorial takes you through some of the basic steps of internationalization in the NetBeans IDE. We will set up internationalization for one form and later on design that form. Then we internationalize the whole project, which contains several forms in a few different packages. You can internationalize applications either by specifying automatic internationalization or by using a special wizard. Internationalization permits applications to be adapted to various languages and regions without requiring engineering changes or recompilation. Internationalized programs enable textual elements, such as status messages and GUI component labels, to be stored outside the source code and retrieved dynamically rather than hard-coded in the program. You typically store your internationalized strings in properties files, in the form of key/value pairs. The key is the identifier used by the program to retrieve the text, and the value is the actual text. You create one properties file for each locale (or language) in which you translate the program. The keys are the same in each locale - only the strings are different. In this exercise we will open the demo Java application project, which contains a well-known find dialog created using the GUI Builder. Next, we will switch on automatic internationalization for Form FindDialog.java. In order to test our internationalized GUI form, we will add a new locale to the properties file and run the form in the non-default locale. Download and unzip the InternationalizeDemo.zip project to any location on your computer. Choose File > Open Project, navigate to the InternationalizeDemo project that you extracted in the last step, and click Open. The project folder might be in a containing folder that is also called InternationalizeDemo . 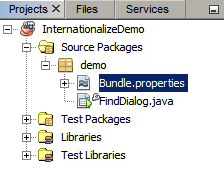 Expand Source Packages > Demo and double-click FindDialog.java . The sample form opens in the GUI Builder. Select the root node in the Navigator Window (named Form FindDialog ). In the Properties window, select the checkbox in the Automatic Internationalization property. Click Upgrade in the GUI Form Format Upgrade dialog box. 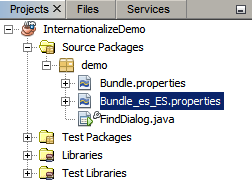 If the checkbox is selected, the IDE creates the Bundle.properties file in the demo package as it is set in the Properties Bundle File property. If you need to have the Bundle.properties file in a different location, you can click the ellipsis (…​) button to the right of the Properties Bundle File and choose a location or directly type the path in the property’s text field. In the Projects window, double-click the Bundle.properties node in the Projects Window or right-click the node and choose Edit. The properties file is opened in the Source Editor. As you can see, all appropriate Keys and Values for Form FindDialog.java are generated. (The name of each key is derived from the form file name and the component Variable name. For example, the key FindDialog.jLabel1.text is generated for a component with the variable name jLabel1 placed in form file FindDialog . The value jLabel1 represents component’s Text property in this example. We will now use the GUI builder to enter internationalized strings for the JLabels and JButtons in the form. Select the appropriate GUI component (e.g. jLabel1 ) in the Design Area. In the Properties window, click the ellipsis (…​) button for the Text property. You can also internationalize other properties that have String values, such as Mnemonic, Accessible Name, Accessible Descriptor, and ToolTip. Type Find What: in the Value field. Steps 1-5 can be done in a simpler and faster way: just double click jLabel1 in the design view, change the text from jLabel1 to Find What: , and press Enter. The result is the same as from the steps given above. Control-click all eight of the jCheckBoxes in the form to select them. With the jCheckBoxes selected, right-click any one of them and choose Same Size > Same Width from the pop-up menu. Apply Steps 1-2 to the three jButtons. Select the root node in the Navigator Window (the Form FindDialog node). In the Properties window, click the ellipsis (…​) button for the Design Locale property. In the New Locale dialog box, choose es_ES from the Predefined Locales: combobox. In the Projects window, right-click Bundle.properties and choose Open. Press Ctrl-S to save your edits. Select the FindDialog.java tab to display the form you are internationalizing. Right-click the root node in the Navigator window and choose Reload Form (alternatively, press Ctrl-R). In the Projects window, right-click the InternationalizeDemo project and choose Properties. In the Categories pane, select the Run node. Enter -Duser.language=es -Duser.country=ES in the VM Options field. Right-click the InternationalizeDemo project and choose Run. The IDE runs the FindDialog dialog box in the Spanish locale like shown below. Generally, we have several files in the default locale and we are asked to adapt them in order to be translated to other languages. The Internationalization Wizard is the perfect tool for this task, as it can internationalize multiple files at once. We will show this feature on the GUI Form examples project, which contains the form created in the Designing a Swing GUI tutorial. Choose File > New Project or click on the New Project icon in the IDE toolbar. In the Categories pane, select the Samples > Java node. In the Projects pane, select GUI Form Examples. Click Next. Enter GUIFormExamples in the Project Name field and specify the project location (e.g. /space/projects ). Choose File > New File or click the New File icon in the IDE toolbar. In the Categories pane, select the Other node and in the File Types pane, choose Properties File. Click Next. Enter ContactEditor in the File Name field. Click Browse and specify the GUIFormExamples/src/examples folder as the file location in the Browse Folders dialog box. The IDE creates the ContactEditor.properties file and opens it in the Source Editor. 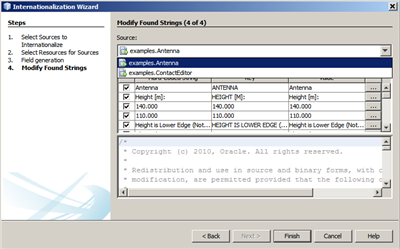 Repeat previous steps to create another Antenna.properties file. In the Main menu, choose Tools > Internationalization > Internationalization Wizard. On the first page of the Wizard, click Add Source(s). 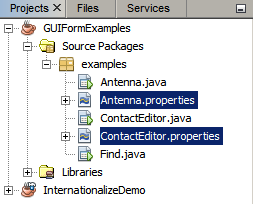 In the Select Sources dialog box, expand the Source Packages > examples nodes and control-click the Antenna.java , ContactEditor.java , and Find.java files to select them. For demonstration purposes, select examples.Find and click the Remove Source(s) button. 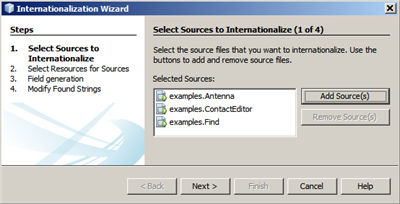 Check if the Internationalization Wizard offers the correct properties files examples.Antenna and examples.ContactEditor . If it does not, use the Select Resource button to choose the correct properties file. Skip page 3 of the Wizard since you are not going to create any fields and modify additional values and click Next. 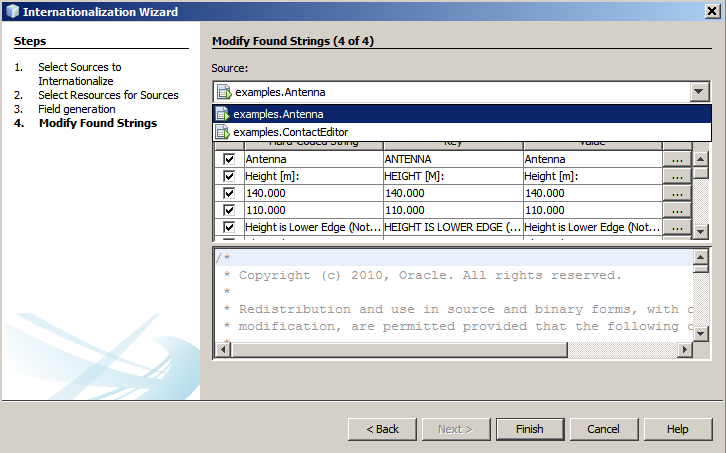 All hard-coded strings are displayed in the last step of Internationalization wizard and it is possible to decide which of them will come from the properties file (use checkbox). You can further customize individual keys, values, comments, and format of replaced strings by clicking on the ellipsis (…​) button for a string. Now, the internationalization of source code is finished, other locale can be added and tested as it was shown previously. Using automatic I18n features is the easiest way to internationalize a GUI form. But if you don’t have the update pack installed, or you also want to internationalize code not generated by the Form Editor, then using the Internationalize window is the way to go. (This feature works with any .java file, not just files created with the Form Editor). 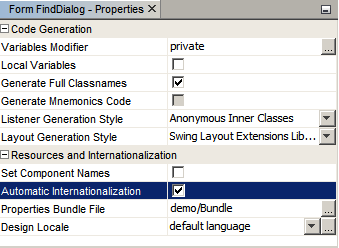 The next example uses the Internationalization window, which is a part of default Netbeans IDE installation. 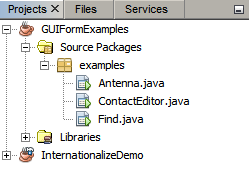 In this last exercise we will reuse the GUI Form Examples project and internationalize the Find.java form, which we excluded in the previous exercise. We will invoke the Internationalize dialog box to replace all hard-coded strings in this file. Finally, we will go through a short demonstration of how to insert an internationalized string in the source code when you are writing a program. In the Projects window, select Find.java and choose Tools > Internationalization > Internationalize from the main menu. The IDE shows Internationalization dialog box and pre-fills the first hard-coded string from the Find.java source code . Click Select to select a particular properties file or create a new one. In the Select Resource Bundle dialog box, enter Find.properties in the File Name text field, click Create New and then OK.
You can modify format of replaced string, key, value or comment if it is necessary. We’ll just leave the default values. Click Replace to confirm the change and move a focus on the next hard-coded string. If a hard-coded string does not need to be replaced, click the Skip button. 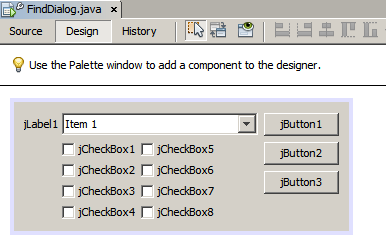 In the Projects window, right-click Find.java and choose Edit. The IDE opens the Find.java file in the Source Editor. Scroll through the source code and find the main method. Place the mouse cursor within the parentheses of the System.out.println(); so that an internationalized string is inserted as a parameter. Press Ctrl-Shift-J to invoke Insert Internationalized String dialog box (alternatively, you can choose Tools > Internationalization > Insert Internationalized String from the main menu). 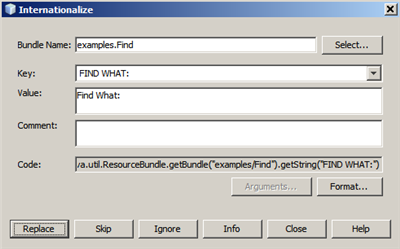 For Bundle Name, click the Select button, select the Source Packages > examples folder, and enter Find as the Bundle name in the File Name text field. Then click OK. 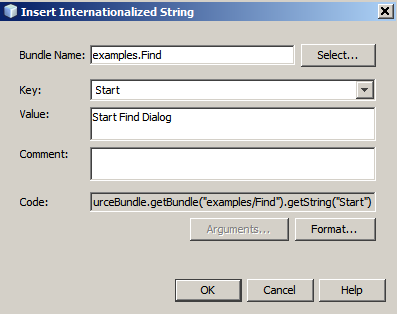 The Bundle Name field of the Insert Internationalized String dialog box shows examples.Find . Type Start in the Key drop-down box and Start Find Dialog in the Value field. Then click OK.